The pull pinata party game is the “main feature” of a kid’s indoor party. 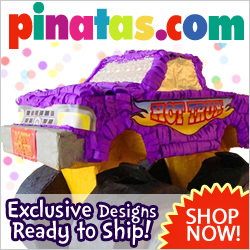 Make your indoor party just as exciting as an outdoor party with a pull ribbon pinata. Remember that for this game you will also need party favors and candy to fill your pinata. If you’re playing the traditional pinata party game, you will need a pinata buster and a blindfold. The pull pinata has a secret trap door and 20 to 30 ribbons that hang from the bottom. Only one “lucky” ribbon, however, is attached to the trap door that opens when the ribbon is pulled, allowing all the goodies to spill out. All the other ribbons are lightly attached and pull off when tugged. To add fun to this game and to ensure that all kids get a prize, tie treats or prizes to the end of each ribbon. You do not need pinata busters or blindfolds to play this version of the pinata game, but, if you choose, it can be broken like a traditional pinata.